Over Thanksgiving break, they went on vacation to beautiful Key West. Eryan grew up vacationing there, so it was a very special place to him and his family. Eryan’s family was also along for the trip over Thanksgiving. On the third night of their vacation, Eryan wanted to go out to dinner, just he and Karley. So, they went out, and after finishing their dinner, Eryan told Karley he had to go out to his truck to get Advil before their plans of walking around downtown. She didn’t really want to walk because of how much walking they did earlier in the day; she was exhausted! Karley says that after about three failed attempts of Eryan trying to propose to her, he finally just stopped and asked her to marry him. They were surrounded by boats down on the dock, which sounds like such a romantic backdrop. Key West will now hold a special place in Karley’s heart! Click here to view their engagement session from earlier this year and read more about their story. 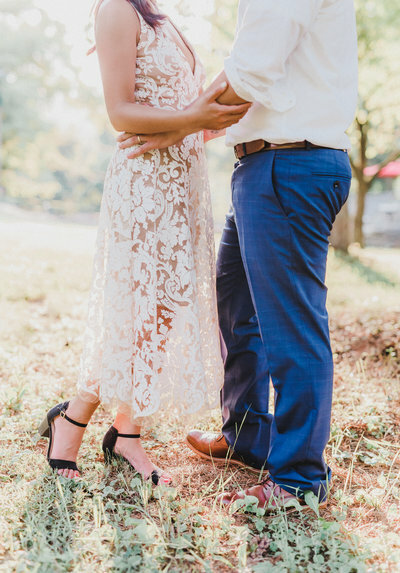 The beautiful couple held a rustic, elegant, yet casual wedding at Wind in the Willows in Grantville, PA on September 29th, 2018. The weather was perfect, love was definitely in the air, and everyone had a blast celebrating the newlyweds. Karley and Eryan started growing flowers for the ceremony back in May of this year, so it was really special for them to see how all their little details came together. From the old hutch restored by Karley and her dad to the ice cream brought by Fox Meadows Creamery, their wedding day was one for the books! Thank you guys so much for having us play a special role in your day, and congratulations! We can’t wait to follow along with your journey as the new Mr. and Mrs. Siegfried. This is a first for us: witnessing the bride putting in her own veil! Haha, Eryan! Karley shared a first look with her dad before going out to see Eryan for the first time. So sweet!